You can obtain couple of editions, Main and Universal; Main edition has all the codecs and support for the restricted formats (such as g-streamer, lame for mp3) installed by default whereas Universal pops up the dialog box asking if you want to download media codecs; with one click to confirm, it goes away for all of 20 seconds and does it. The ‘100% free software’ zealots still won’t like it, since it is actively supports the use proprietary and closed-source media codecs - no hassle acquiring scarily-named Restricted Extras meta-package the way you do in Ubuntu. Does the new release make it anything other than “Ubuntu with codecs”? Reviews of previous releases in Full Circle declared it a Linux distro’ for beginners and converts. Mint aims to make the whole experience of installing, configuring and maintaining a Linux desktop feel a little more seamless, easier and more logical for new users or Windows converts. Don’t dismiss the little touches like the welcome screen that pops up with help and guidance at login, this may be the distribution for newcomers to Linux. I’m running it on a spare machine built from salvaged old tat and some sheet perspex: Abit Pentium4, 2.14GHz clone, 1Gb memory, Geforce-IV AGP graphics card, Belkin wireless USB dongle. Remarkably given it’s complex Ubuntu 9.04 underpinnings, Mint 7 has speed, performance and stability, even on this lash-up. Installer: standard Ubuntu-style installer. It works. Everything is done for you. There’s nothing to edit at the end. Wireless: even on a USB dongle, it works. I didn’t have to tell it a thing. No Ndis wrapper or Windows drivers required. The trouble I used to have with this thing under different distro’s... not under Mint. 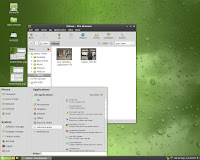 Desktop and Menu system: no default top panel, but a unified and attractive desktop, not dissimilar to a Windows start menu, task bar and notification area. Look and feel: of course you can change it, but the standard theme looks very smart. In shades of green with black, it wouldn’t be out of place on a corporate desktop, that’s not to say it’s as hard-edged, macho or techno-obsessed as other themes we could mention. Bundled Applications: Mint is bundled with the latest Firefox, Thunderbird, Rhythmbox, Brasero, Mplayer, Pidgin, Transmission and a selection of other up-and-coming productivity tools; Gnome-Do, Tomboy and Giver. Browser plug-ins like Flash come ready to go, so YouTube videos play straight away in Firefox. Moonlight is also included so if you install Mono app's or visit certain websites, you don’t have install a plug-in. I threw a stack of media files into Gloria and for each left-field format, Mplayer popped up a box with its diagnosis and recommendation; only on your confirmation does it then fetch the right codecs. Mint applications: the special app's were always a strong selling point; what made mint so easy, the install and config' utilities. Install package ‘xine’ (which is pretty obvious). It all works and it’s a very easy way to install new software. mintUpdate is a superior version of Ubuntu’s Update Notifier, providing a list graded 1 to 5 for risk factor. You can choose what to update at any given time based on risk (stability of the package) or size of download. If that’s not enough, there’s also mintInstall, which addresses every way of installing software on a Debian system and wraps them in an attractive graphical front-end. You can browse the software, get descriptions and reviews, all in one interface. This is leading the way with innovative touches such as displaying a screen-shot of a listed application, a feature which has found its way into Synaptic. It’s not perfect, sometimes it takes a while to find a screen-shot (or realise there isn’t one). You also get to browse a predefined list of ‘Featured Applications’. Click the ‘Featured Applications’ button to get a list of popular applications you can install simply by selecting its radio button. How much easier do you want it? mintBackup, lets you make a backup of your home directory; just remember to include hidden folders such as your Thunderbird user profile - easily done from the hidden folders tab within the app’. Its not a full-featured backup tool but if you keep all you personal stuff together in one place, you’ve covered the essentials. mintNanny, provides a parental-controls black-list of blocked websites. 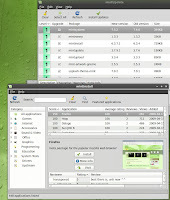 mintDesktop provides an easy way to configure your desktop without diving into gconf files with a text editor. How does it run in practice? Mint is built on solid foundations, Debian and Ubuntu. It benefits from the vast Ubuntu repositories and installing new software becomes almost trivial. It may not be backed by a big commercial support operation like a Canonical or a Red Hat, but then a beginner is less likely to break Mint and need to raise a support call. I can’t think of any serious niggles. Install it from a Live CD as I did, or download from the ever-effective Mint website.